Love the okra in this dish. When it comes to corn my mother’s was always the best. We had fried corn which some might call cream style corn but it was nothing like the canned variety of sweet, runny corn that you might buy to put in a Mexican corn bread recipe and our corn certainly was not sweet. 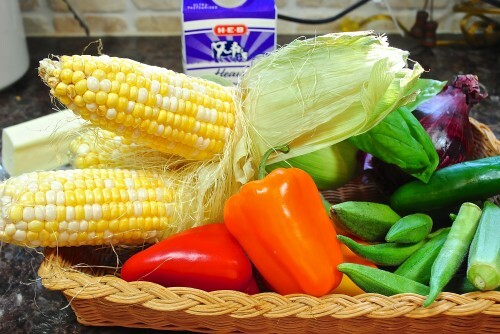 I never care for some of the corn you buy in the store that is called super sweet. Who wants corn that taste like dessert. I want corn that taste like what I grew up on. Our fried corn always started with big ears of field corn and we would barely cut off the tops of the corn with a knife and then use the blade to scrape down the cob releasing all the milky creaminess that was left behind on the cob, all the while splattering all over yor hands and the counter. It was well worth the mess because after frying up a few pieces of bacon the corn would be added to the fat in the skillet (cast iron of course) and cooked until it was reduced to a thick corn dish which only needed a little salt and pepper. Several years ago a neighbor of mine was sitting out in her front yard shucking corn. I asked her what she was making with so much corn and she replied Maux Choux and when she described the technique I knew it sound like like our Southern fried corn but with a Louisiana twist. I have been wanting to try Maux Choux for years but just never got around to it. 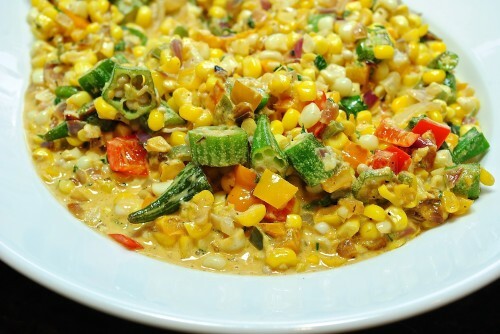 So, here’s my attempt at transforming my simple fried corn to a new level. Hope you will try it. Cute little baby bells I picked up at Sams Club. I decided not to use the basil in the picture but oregano instead. Sauteing some of the vegetables. 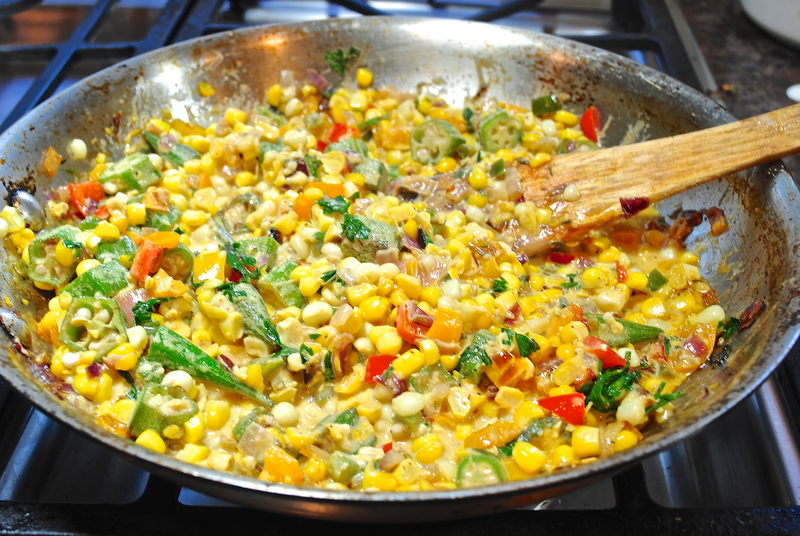 Stir in the corn and saute another 4-5 minutes. Stir in the cream and the parsley. Heat a 10″ skillet then add the butter and stir until melted. Add in the red onion, jalapeno and the chopped bell peppers and saute for about 4-5 minutes until the onions start to get translucent. 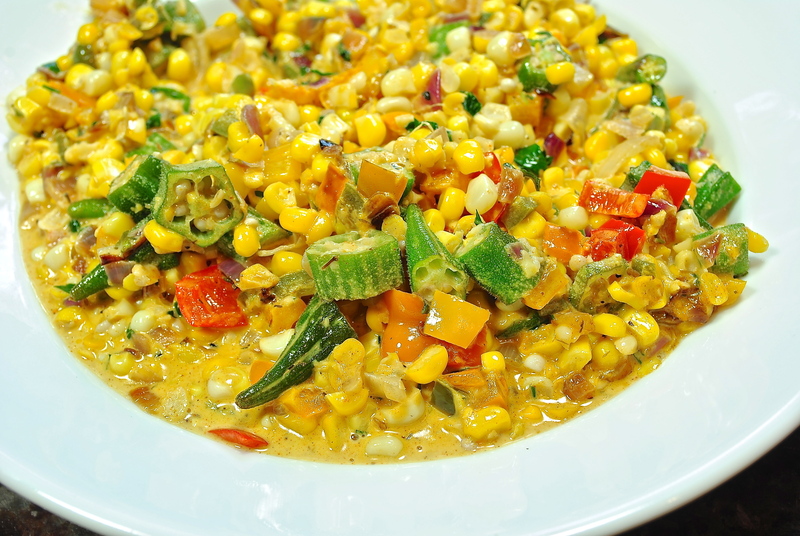 Add the okra and stir for another 2-3 minutes and then add the corn kernels, thyme, oregano and salt and pepper. 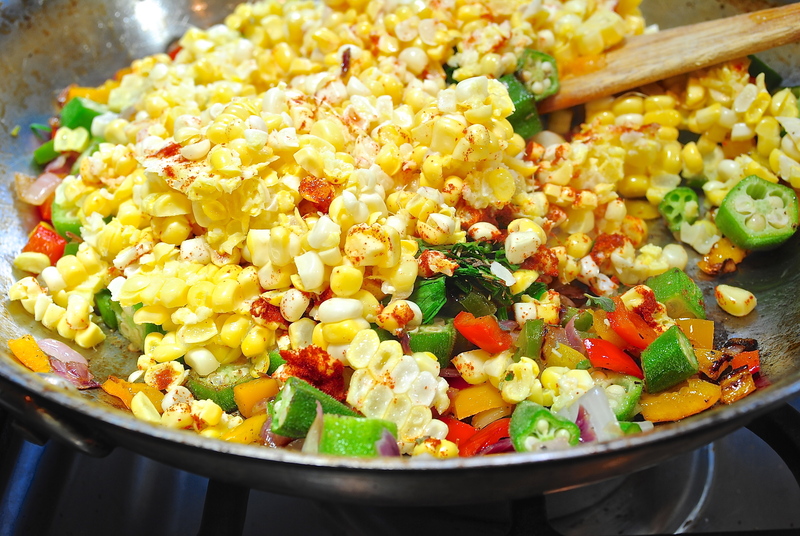 Stir about 3-4 minutes until corn looks done but still crisp. Stir in the cream and mix thoroughly. 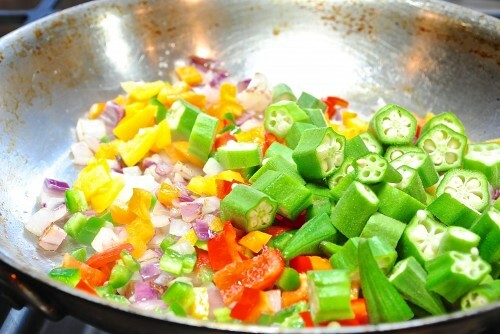 I can’t wait to try this with my okra from the back yard. We’re getting a little tired of fried okra a couple times a week. Thanks for the recipe. I really liked the combination of the corn and okra. I have never cooked the two together before.